Since the first post on this site in August, 2011 I’ve written about woodworking, the American Arts & Crafts period and SketchUp. My interest in SketchUp began with my own use and that led to teaching other woodworkers how to model projects in three dimensions without fooling around. Life is too short and there are too many interesting things to explore to work harder and longer than you need to. In the last few years I’ve been teaching more and in my journey to become a better teacher I explored the different ways people learn and I tried to find the best ways to transmit information. I’ve been blessed to meet people who work with young people on a daily basis in our schools. I’ve seen kids who at one time were close to being written off blossom into productive, fulfilling and interesting lives. How does this connect with my interest in 3D modeling with SketchUp? The skills of a good designer, engineer, editor or cabinetmaker are essentially the same. It’s mostly critical thinking and problem solving with a portion of technical expertise. I believe the world will be a better place if the coming generations have the ability to recognize a challenge and develop a way to overcome it. SketchUp provides a way to interest and engage young people in learning as well as a way to develop important fundamental life skills. I’m spending more of my time developing content designed to help others develop the skills they need to use SketchUp so they can better teach their students how to 3D model. Kids can start modeling in 4th grade and be skilled by the time they become high school freshman. In high school they will be ready to apply those skills to more technical areas. By the time they graduate high school they will be ready for a career, or really ready for college. If they don’t pursue a technical career they will possess a different way of looking at the world and be adept at finding solutions. One thing I can do is carve out a chunk of bandwidth devoted to that specific topic. 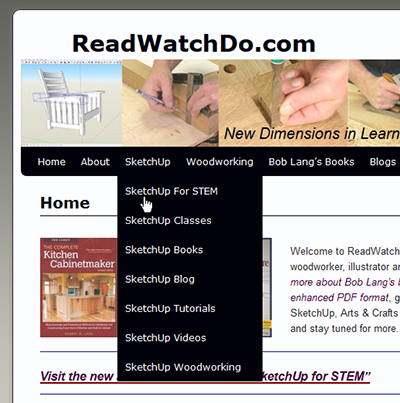 If you look at the site menu you’ll see a new addition “SketchUp for STEM”. That page also has its own URL: sketchupforstem.com. The idea is to create a resource for the thousands of teachers who are tasked with teaching science, technology, engineering and math but don’t have all the tools they need to accomplish their mission. SketchUp can be the thread that connects young minds with subjects they don’t yet realize are fun and fascinating. If you read this blog because of your interest in woodworking or the Arts & Crafts period there will still be plenty of new material on those subjects, as well as the existing online articles, books and plans. If your interest in SketchUp is not related to education, you will still find plenty of tips, tutorials and resources to help you become a better modeler. Keep an eye on the new page, because articles about 3D printing and other topics will likely appear there. If you’re an educator, or know an educator there is now a place to go (with an easy to remember address) with resources to help you help your students. Take a look at SketchUp for STEM, let me know what you think and tell a friend. This is great Bob. I’ll be sending this to my friends in education While simultaneously trying to figure out how to incorporate this into the things I teach my girls. I’m very passionate about this topic. Thank you. Kids are a lot more visually oriented, and are used to playing with images on a computer screen. SketchUp is a powerful tool to engage young people in almost any subject because it taps into the part of the brain they like to use.